This Saturday is the “Meet the Artists” night at DC’s Artomatic Art Fair – from 7 – 9 pm. The James Renwick Alliance will also host a reception at Artomatic on Saturday, June 2 from 5:00 to 7:00 PM in the JRA Education Room, #1106, on the 11th floor. Many of artists whose work was selected the JRA as recipients of the Award of Excellence will be at the reception – starting around 6 PM. 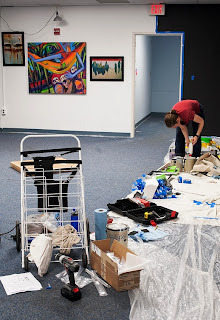 At the Prince George’s County Parks and Recreation Room on the 3rd floor @ 7:30pm, they will announce the Department’s purchases of artwork by Prince George’s County artists for the Department’s permanent collection – for a bit of art excitement! With the Memorial Day Weekend here, a blog posting that touches on themes of American Art & history is in order. 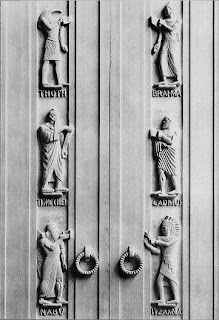 The Process looks at how the Washington Glass Studio artists are recreating the original, historic bronze doors from the Library of Congress (LOC) Adams Building in kiln-cast glass. 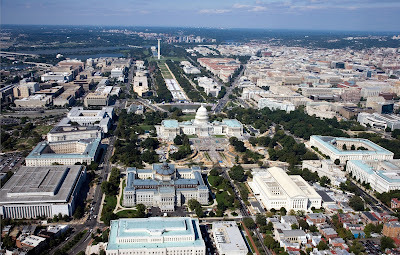 As mentioned in an earlier post, the Architect of the Capitol (AOC) oversees this landmark building, and they sought out ways to provide up-to-date functional aspects for their structures, all while balancing the requirement for maintaining the artistic legacy of its buildings – a daunting task in an ever changing world. 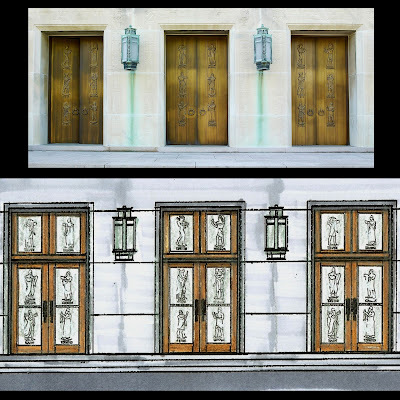 Their design for the LOC Adams building was to have the historic bronze entry doors (that could not be brought up to code) set in the “open” position, and install new code-compliant functional glass doors for the public access – with the glass doors designed to reference the original door sculptures. (Click HERE to jump to link post of sculpted bronze door features.) Washington Glass Studio is creating the new cast glass panels, and this edition of The Process looks at how the molds are being taken from the original doors in-situ. Sean Hennessey, the master caster, sets up his mold making equipment and preps the doors. 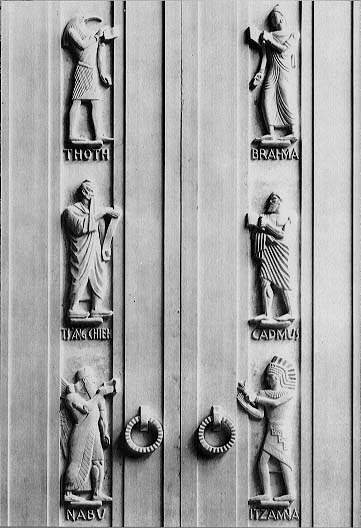 The LOC was very concerned that the mold taking process could adversely impact the patina of the bronze doors, so before any work on the doors was completed, testing of the materials and release agents were conducted on an inconspicuous section of the backside of the doors. 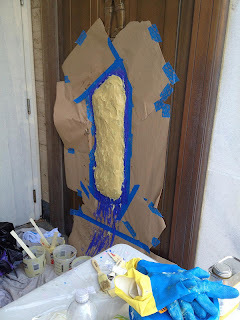 A section of the door backside was tested for any reaction to the materials. The sample came off with no residue or impact to the original bronze finish. Given the go-ahead, Sean enjoys a day in the sun. 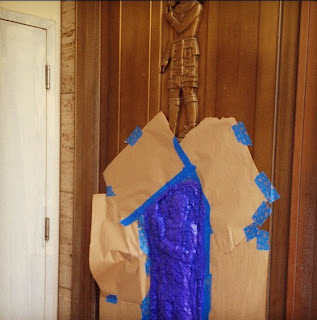 The bronze door area surrounding the bas-relief is masked off. 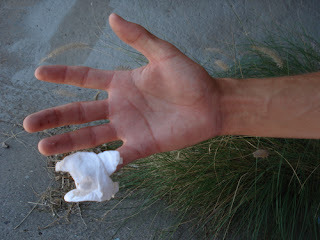 Care is taken for the surrounding area. Sean shown here assisted by Erin Cumbo. The layering of the silicone rubber mold material starts. The mold is allowed to set-up until firm, and then peeled off. “Mother Mold” material is added to give structural strength to the casting. The molds will later be used to create the original forms for the kiln-casting process – more about the glass casting process in later postings!. 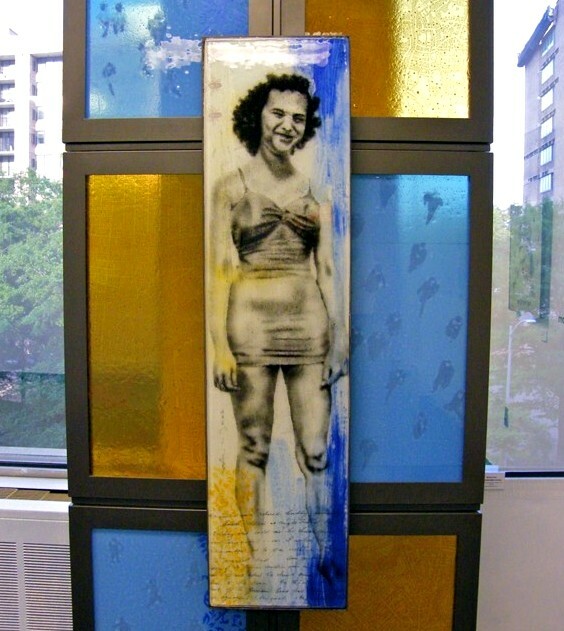 The Washington DC Metro area has a robust sculptural glass community spearheaded by the Washington Glass School and DC Glassworks. 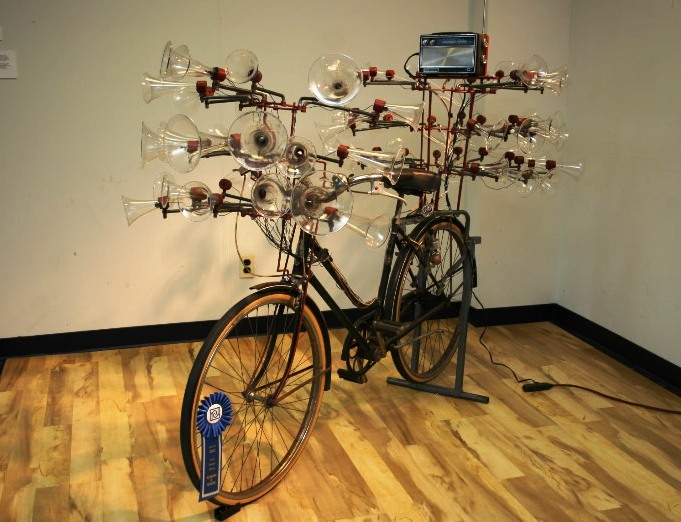 Sean Hennessey, resident artist at the Washington Glass School will be giving tours showcasing select examples of the works coming from these studios, as well as works of other glass artists in the DC region. 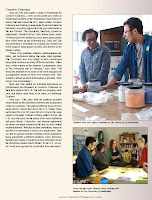 The recent issue of Glass Art Magazine features all of the Washington Glass School’s co- directors in the latest issue and online. 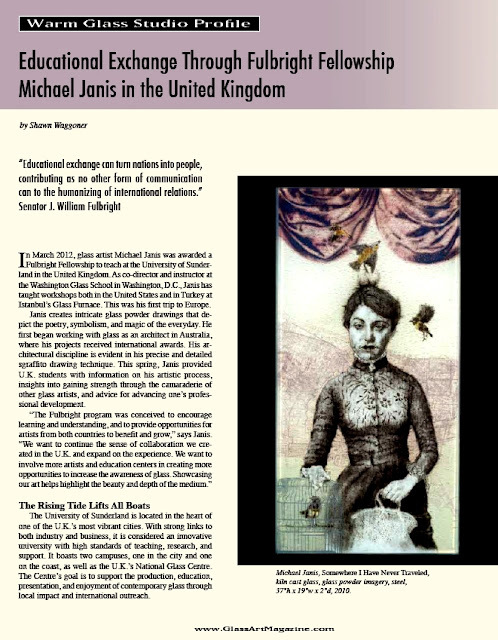 Michael Janis’ work on the cover and his profile as the centerfold story, and the same issue also features Erwin Timmers work across a five page story on his work in ecologically sustainable artwork. The magazine’s online website now features a new story on Michael and Tim Tate’s work as Fulbright Scholars in England, while at the University of Sunderland, the National Glass Centre, the London AAF, and Creative Cohesion studios. 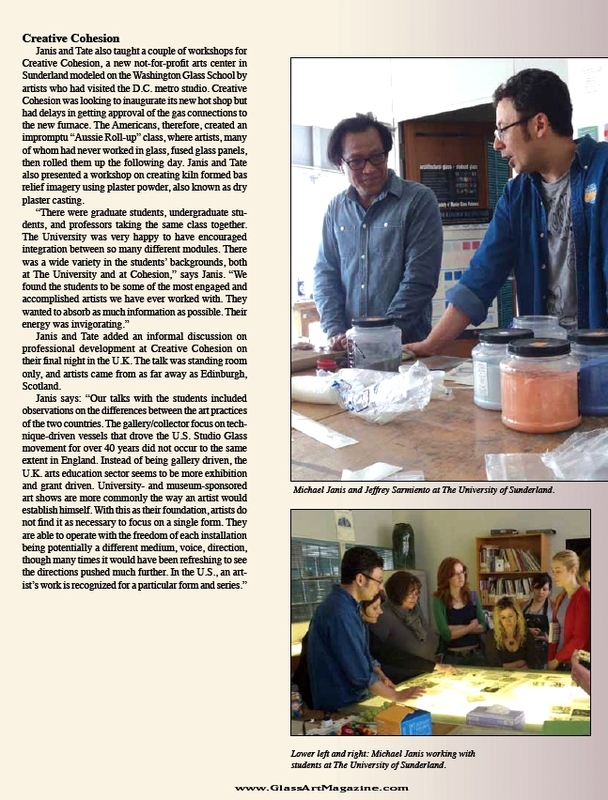 The article has a great synopsis of the differences between the US & UK approach to the artistic medium of glass and also has some photos of Jeffrey Sarmiento joining Michael’s sgraffito class. 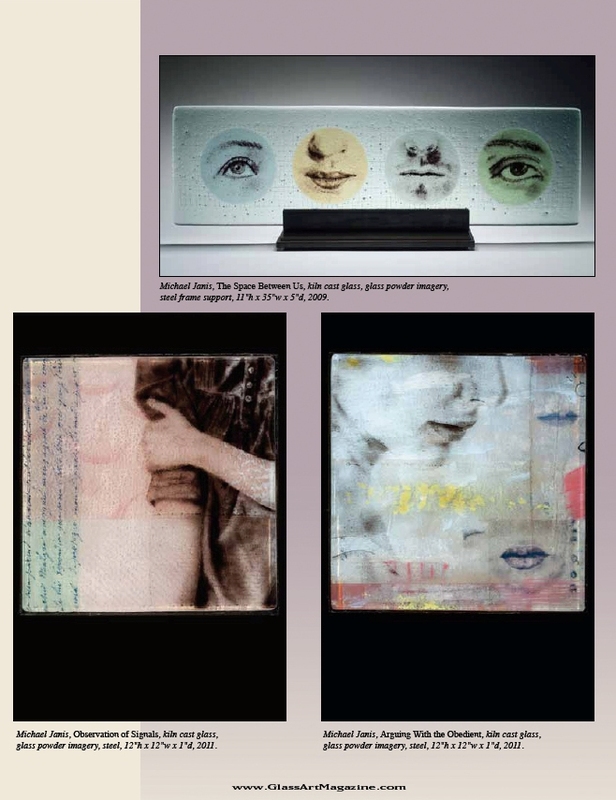 Click HERE to jump to Glass Art Magazine’s downloadable pdf of the article. The Fulbright program has announced its new awards – have a read! The Fulbright Commission US Scholar Awards for 2013-14 are now open. The US Scholar Awards offer US academics and professionals the chance to undertake research and/or teaching at any accredited UK higher education institution. Opportunities are available for college and university faculty as well as for professionals, artists, journalists, scientists, lawyers, independent scholars and many others. As well as an All-disciplines award they also have specific partner awards. If you in going to a UK university through the Fulbright programme to contribute to research and/or teaching then please take a look at the awards on offer – or if you know of any US scholars or professionals that would be interested then pass this information on to them. Fulbright Awards offer generous financial support for academic projects in the UK. Additionally, Fulbright scholars in the UK are invited to participate in a wide range of events, and benefit from a variety of additional opportunities and support provided by the Fulbright Commission. Fulbright scholars also benefit from an extensive range of alumni and global networking opportunities after their exchange. The panel discussion How Experts Determine What Works of Art Stand out was organized by Giselle Huberman, left. 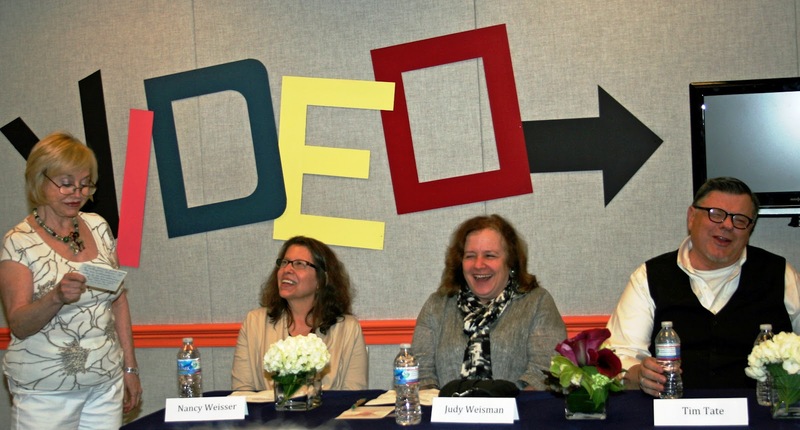 Panels were Nancy Weisser, Judy Weisman, Tim Tate and Cynthia Boyer, not pictured. The James Renwick Allinace (JRA) held a fun talk at Artomatic this past weekend – titled “How Experts Determine What Works of Art Stand Out”. 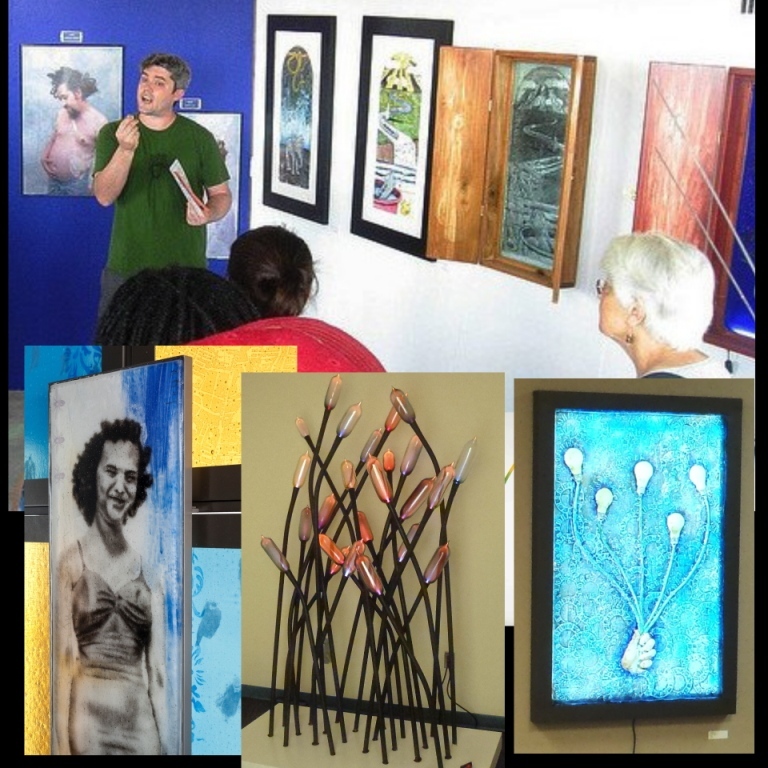 · June 2 at 5:00 to 7:00 PM – a JRA reception scheduled for Artomatic’s “Meet the Artists” Night planned for 7:00 to 9:00 PM. · · June 22 at 8:00 PM – The public is invited to join a panel of JRA Award of Excellence winners as they discuss their work. Check out all the Artomatic events coming up – click HERE! >The James Renwick Alliance (JRA) is an independent national nonprofit organization dedicated to advancing scholarship and education on contemporary American craft, to supporting activities directed toward this purpose, and to encouraging connoisseurship and collecting. 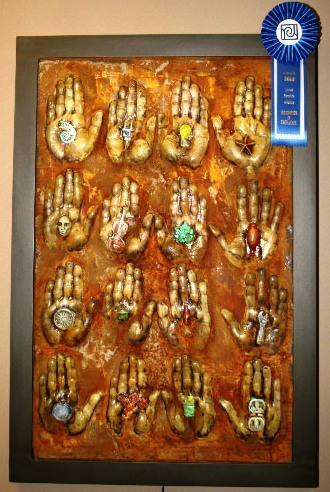 The JRAassists the Smithsonian American Art Museum in adding to its permanent collection of American craft. For over 25 years, the JRA has supported activities and programs involving hundreds of artists, art supporters, galleries, and partnering institutions from across the nation and around the world. As part of their mission for the arts, the JRA are sponsors of a workshop/reception “Renwick Alliance Room” in the huge DC Arts Fair – Artomatic. Located on the 11th Floor of the festival, the JRA has planned workshops and talks throughout the month long run of the show (thru June 23). 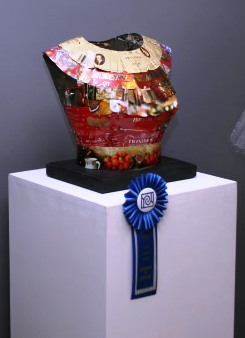 Members of the JRA has also went thru the 10 floors of artwork – selecting their Top 10 media-based artists for their 2012 Artomatic “Award of Excellence”. Congrats to the WGS/DC Glass artists & all the artists involved in the huge event! And a big hug to the James Renwick Alliance! The James Renwick Alliance welcomes the public to join them in a pre meet-the-artists-night reception. Mingle with other craft lovers! The JRA will be distributing maps they have created to help you find the media-based artists of Artomatic. 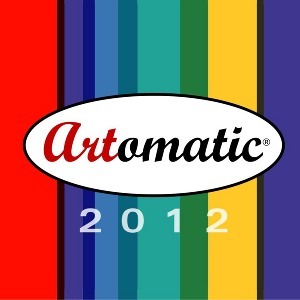 Art Extravaganza Artomatic 2012 Opens! Artomatic is a month-long art festival in the Washington, DC area that is “by artists, for everyone.” It is an unjuried arts show that features 10 floors of art by more than 1,000 artists. The artists have taken over a building in Crystal City (right at the Crystal City metro stop – yellow line). The diversity of artwork and performances attract the broadest range of people, providing a forum to come together and illustrate the energy, vitality and strength of the arts in the community. No matter what kind of creative events you like, you will find something for you at Artomatic – visual arts, music, performance, film, fashion, and more. There will be workshops, tours, art seminars and other events held there all month long. Artists have been working to transform the mundane into into an arts space that is choc-a-bloc with treats that require discovery. From the chaos of art – a moment of sublime. Tim Tate and Pete Duvall’s video installation on Level 10. This (free to the public) show mandates that you visit more than once – there is simply too much to see and do in one visit. 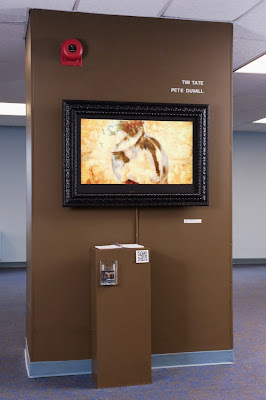 As mentioned in earlier post – Smith Center for Healing and the Arts has been host for SOFAlab – “Science of Art Laboratory” - created to initiate the spark of communication and to look for commonalities that can bring out new understanding and develop new tools of interactions from both the sciences and arts. The collaborative project created will be unveiled this coming Friday – at 7 pm. 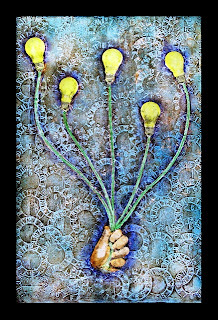 The panels intended to illuminate new ways of thinking by showcasing conversations that bridge the healing arts, environmental realities, neuro-sciences and collaborative networking in the creation of art; and conversely to examine effective new scientific and medical observations, answering questions about how art and science instruct and help one another in raising awareness about environmental responsibility in the area of health care. Looking at the collaborative efforts of three teams of artists and scientists, the evening will unfold their various conversations and inquiries as they have worked together to explore new avenues of awareness. The collaborative team led by Caroline Wellbery and Erwin Timmers considered medical waste and its environmental impact. By looking at areas of concern that mutually affect artists and healers, they have developed conversations and questions about how art and science instruct and help one another in raising awareness about environmental responsibility in the area of health care. The panel is funded by George Mason University’s Center for Consciousness and Transformation and coordinated by Shanti Norris, Smith Center for Healing and the Arts; Paul So, Krasnow Institute for Advanced Study at George Mason University; Helen Frederick, School of Art, George Mason University; and Hamiltonian Gallery. Interns Alex Giller, Aaron Van Andel, Scott Jemielity and Erwin Thamm assisted the program in 2011-12. Erwin Timmers finishes up the mounting of the collaborative artwork that deals with issues of medical waste. 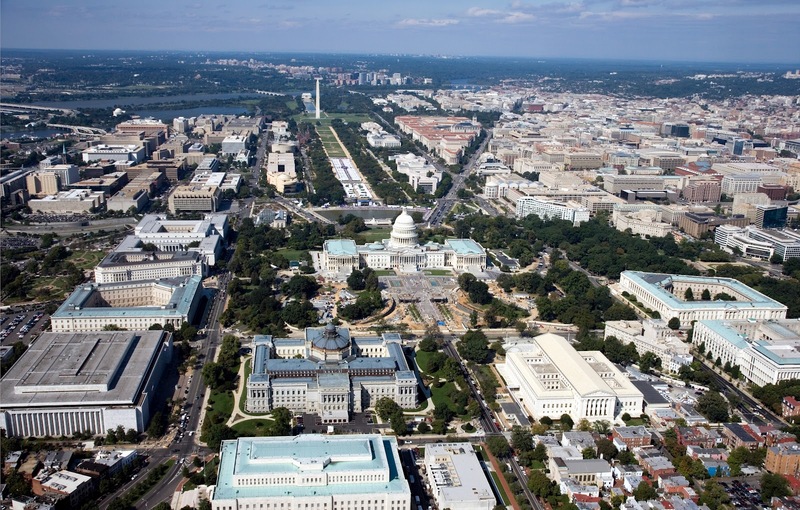 Aerial view of US Capitol on the Mall, Washington, DC. Library of Congress is center bottom of photo. The Washington Glass Studio (WGS) has started the creation of the new cast sculptural glass doors for the Library of Congress (LOC) in Washington, DC. 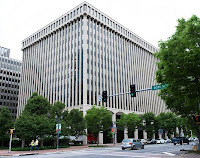 The design of the project started in 2004, when the Architect of the Capitol (AOC) first asked WGS about advise on their initial proposal to replace the original historic bronze doors of the LOC Adams Building, as the doors required security and changes to be code-compliant. The AOC also sought to reference the artistic heritage of the original doors in this important United States building. 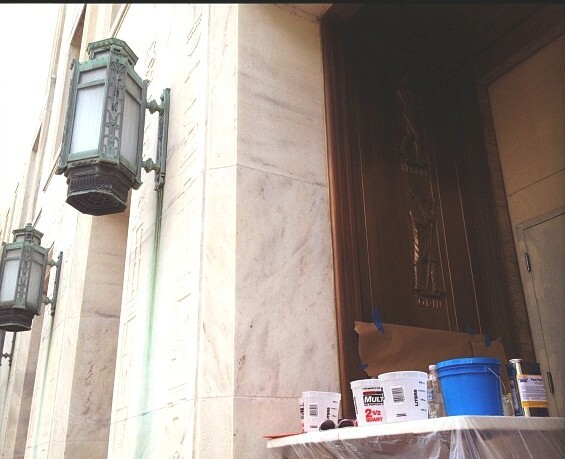 The original (11′-0″H) bronze doors had functional issues and will be retained in their present hold-open position, recessed into architectural niches. 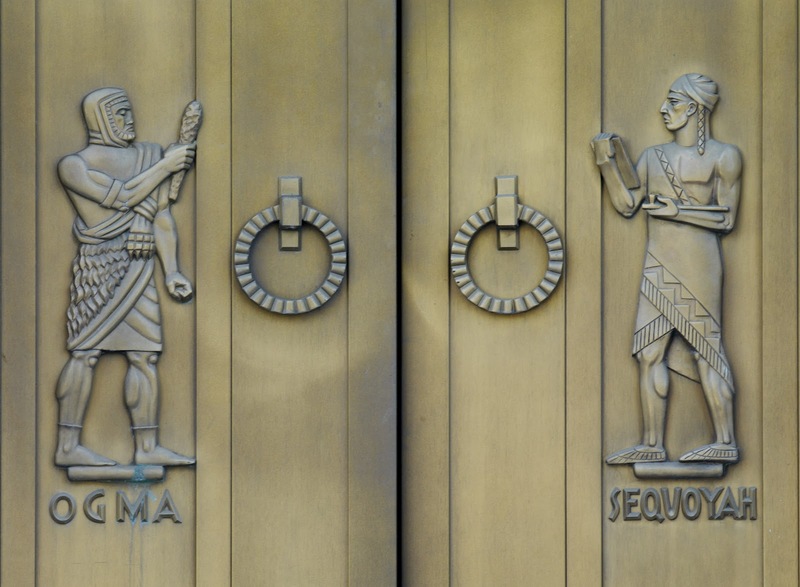 The 16 sculpted bronze doors feature high-relief sculptures by American artist Lee Lawrie, whose best known work is the architectural sculpture on and around New York’s Rockefeller Center. 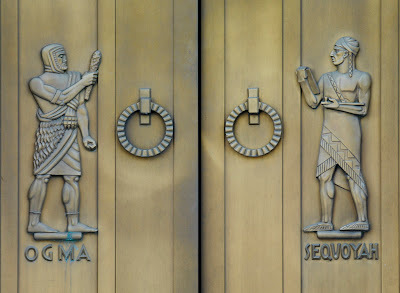 Lawrie’s bronze doors were designed to commemorate the history of the written word, depicting gods of writing as well as real-life Native American Sequoyah. 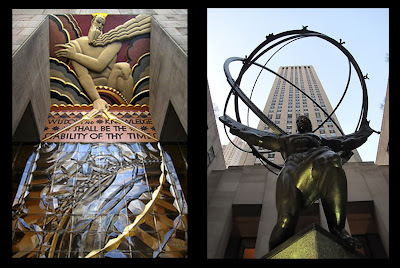 Lee Lawrie, 1877-1963, American sculptor, best known for his architectural work at NY’s Rockefeller Center, especially for the free-standing “Atlas” sculpture. Ogma and Sequoyah, sculpted bronze figures by Lee Lawrie. Door detail, Library of Congress John Adams Building, Washington, DC. The new door design incorporates cast glass panels mounted within a bronze framework, incorporating current egress and security requirements. The kilnformed sculptural glass will be made from molds taken off the original door sculptures. Using clear Bullseye glass to cast, the sculpted glass panels will then be laminated to tempered glass for safety. 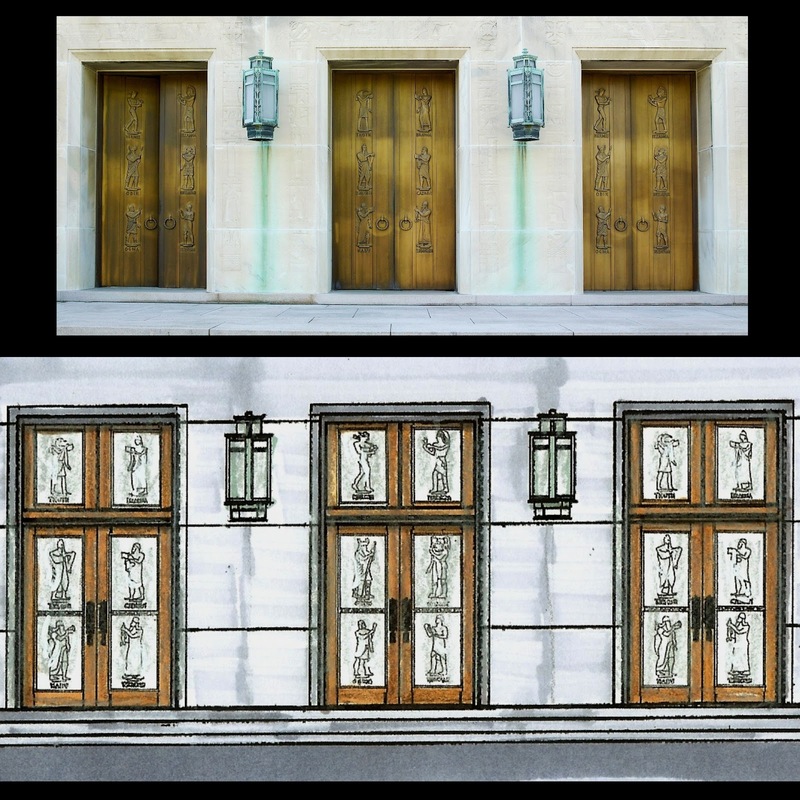 The new glass doors will create a contemporary luminosity to the building entrances, while keeping the character of the historic landmark structure. The scale of the project has prompted a collaboration between Washington Glass Studio and Fireart Glass Studio in Portland, OR. The project “dream-team” includes (Bullseye Glass co-founder) Ray Ahlgren, Erwin Timmers, Michael Janis, Tim Tate and Sean Hennessey. Master mold caster, Sean Hennessey, has started the project, creating the molds from the existing bronze doors in-situ. Some photos of that process will be posted later. Boyce Lundstrom – one of the co-founders of the Bullseye Glass company and fused glass leader – answers questions about vexing glass fusing issues on his website. Recently he posted on other ways to detect the tin side of float glass. As glass fusers know, the tin side of float is contaminated with tin during the float glass making process, and locating the tin side is useful for the artisan. M L Duffy checks for tin side as he creates the cast glass for Safeway supermaket’s Bethesda public artwork. Interesting premise – I have not tried it yet. I am sure that I will feel the cut side of the float glass. Click HERE to jump to Boyce Lundstrom’s Q & A section of his website.